If anyone knows how important it is to have a reliable catcher behind the plate, it’s FIU Baseball Head Coach Turtle Thomas. For the last three seasons, Thomas has been grateful to find someone as reliable as Aramis Garcia. Not only did Garcia — a sports and fitness major — lead the Panthers this season in batting average (.368) and home runs (8), he was also named the 2014 Conference USA Player of the Year and he’s a finalist for the Johnny Bench Award, which is given annually to the nation’s top Division I catcher. Prior to the season, there was buzz surrounding Garcia’s chances of becoming a high draft pick in the upcoming MLB Amateur Draft in June. His performance this season has helped make an even stronger case. Still, thoughts about the future did not keep him from focusing on helping the Panthers in the present. 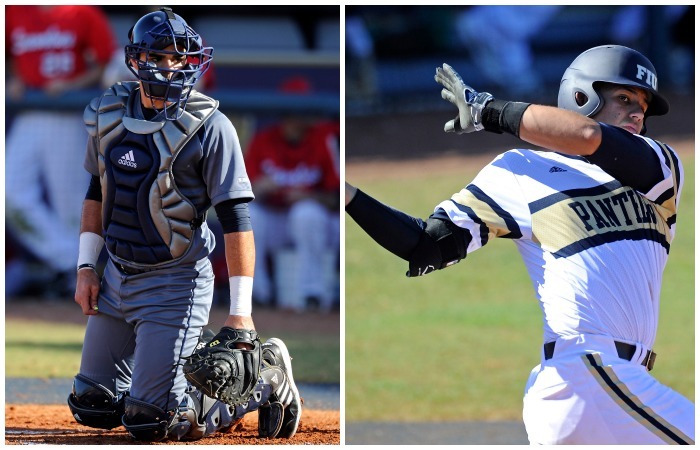 Regardless of whether he decides to go professional or return for his senior season, Garcia has already paved the way for FIU’s catcher-in-waiting. Aramis Garcia (left) and J.C. Escarra (right) have developed a close bond on and off the field. J.C. Escarra primarily played third based at Mater Academy in high school, but his 6-3, 205-pound frame had college and professional scouts recruiting him as a catcher. He was even drafted as a catcher by the New York Mets in the 32nd round of the 2013 MLB Amateur Draft, but decided to go to college and play for FIU instead. When he arrived on campus he began shadowing Garcia, who helped him learn the many intricacies of the position. Escarra quickly picked up on the importance of taking good care of his body in order to handle the rigors of playing catcher, staying positive and maintaining high energy even when things are not going well on the field. Though being a catcher is more physically demanding than playing most other positions, the hardest part of the transition for Escarra were the mental aspects. Escarra — who plans to major in sports management — made his way into the lineup quickly, mostly playing first base while also playing a handful of games at catcher and quickly developed a great friendship with Garcia over the course of the season. In late April, Garcia suffered an oblique strain injury, giving the freshman a chance to prove that he could handle the rigors of playing catcher on a regular basis. In 12 games behind the plate during Garcia’s absence, Escarra had a .292 batting average with six runs batted in before Garcia returned just in time to play in the Conference USA Tournament. The experience gave Escarra even more confidence that he can take over the reigns behind the plate whenever Garcia leaves FIU.